We met at the Bridgend Auction Market car park at 9:15 in the morning, from where shared transport was arranged out to Gortantoid. Our route took us out to Beinn Chalm from where we had a good view over the two sea lochs cutting into Islay, Loch Indaal and Loch Gruinart. On the way we saw quite a few herds of deer, Jack Adamson using the opportunity to tell us quite a lot about deer hunting and stalking on Islay. The safety measures taken, the rules around hunting, the selection of deer to be shot and how to deal with people not following the rules to name a few. Some interesting rules around who owns the deer depending on where and from where it was shot, e.g. in the (probably mostly hypothetical) case that you shoot a deer on your side of the border between two estates but it falls over to the other side of the border when it dies (you are allowed to retrieve it). We passed Loch Leithen and later Loch Drolsay. While taking a rest we saw the other walkers of Walter's and Beth's walk in the distance. 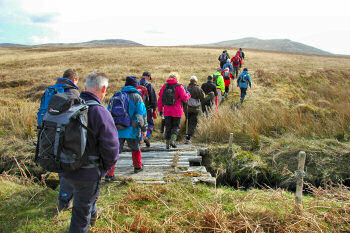 We estimated the number of participants quite accruately, saying there were 25-30 walkers, when there were 31. Excellent participation again in both walks, with 27 on ours. 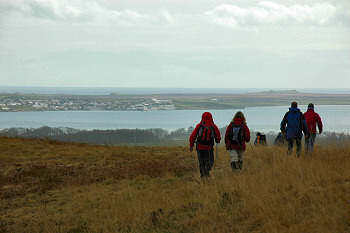 Our final stretch took us the to the hills above Eallabus, from where we had excellent views over Loch Indaal and to Bowmore, despite a short rain shower. This walk certainly gave me a lot of new views and perspectives of Islay, views I hadn't thought of and realised they were possible. I think the same applied to quite a few of the other participants. Another very enjoyable walk with fantastic views! On Wednesday I'll be leaving Islay for the walk with James How on Jura (meet at 09:45 in Port Askaig if you're going to join us). This walk will take us north from Feolin along the Sound of Islay. 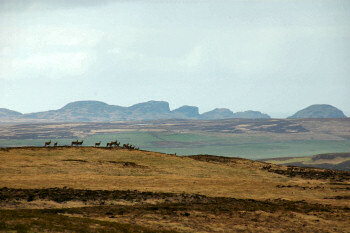 If you prefer to stay on Islay and are looking for a shorter walk, there are two options. Meet James MacAulay at 13:30hrs at Macaulay & Torrie's shop in Port Ellen for a walk around Kynagarry. Or meet Lindy MacLellan at the Service Point Jamieson Street in Bowmore at 13:30hrs for the ‘walkaboutit’ walk.